Only 3 days left! I can’t wait until Monday, when I’m going in to get a big tattoo of a triceratops skull with some flowers around it! I haven’t even seen the design that Mike Bellamy at Red Rocket Tattoo (NYC) has prepared, but I’m sure it will be awesome. I originally posted this on 43things.com, where I found 28 other people who want to “get a dinosaur tattoo” (or already have, like spacebeing and Rachel). 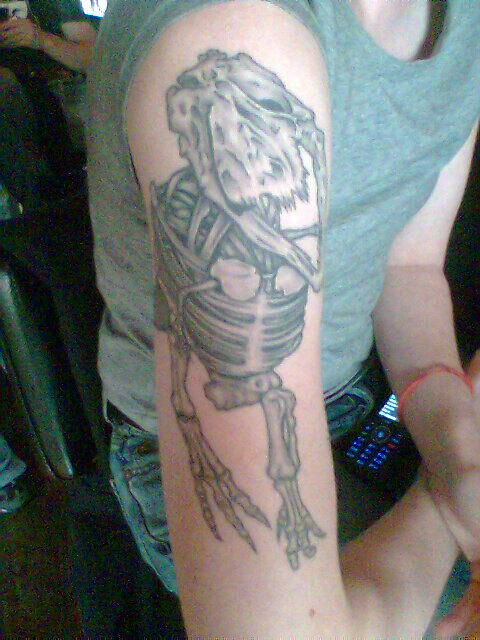 I’ve found a number of other cool dinosaur tattoos whilst wandering around flickr, but my favorite dino ink (dink?) so far is probably this excellent black and grey scene featuring Deinonychus in a forest (from Carl Zimmer’s Science Tattoo Emporium, recently mentioned by Marisa on Needled Blog). Well, I finally got the courage up to go into an actual tattoo shop, as opposed to just lurking around shops’ websites and artists’ TattooNOW profiles. After work on Friday, I stopped in at Red Rocket Tattoo, which I chose not only because it’s highly acclaimed and very convenient, but because every one of the portfolios on their website is full of great-looking work.